Win a Makers Empire 3D Printer Package worth $3,499 for your school! Makers Empire and 3D Printing Systems are happy to be teaming up to give away Makers Empire 3D Starter Package ($3,499) to a lucky primary or middle school. The Makers Empire 3D Starter Package is ideal for schools getting started with 3D printing and design in the K-8 classroom. This competition is open to all primary or middle school students, teachers and parents in Australia and New Zealand. Nominated schools must be in Australia or New Zealand. This competition opens on the 19th July, 2017 and closes September 29, 2017. Full terms and conditions are below. 1) Log in below by email address or Facebook account. 2) Nominate the primary or middle school you want win this prize (see T&Cs below). 3) Follow the entry option. The more actions you take, the more entries you gain. 4) You can also refer your friends/colleagues to gain more entries. 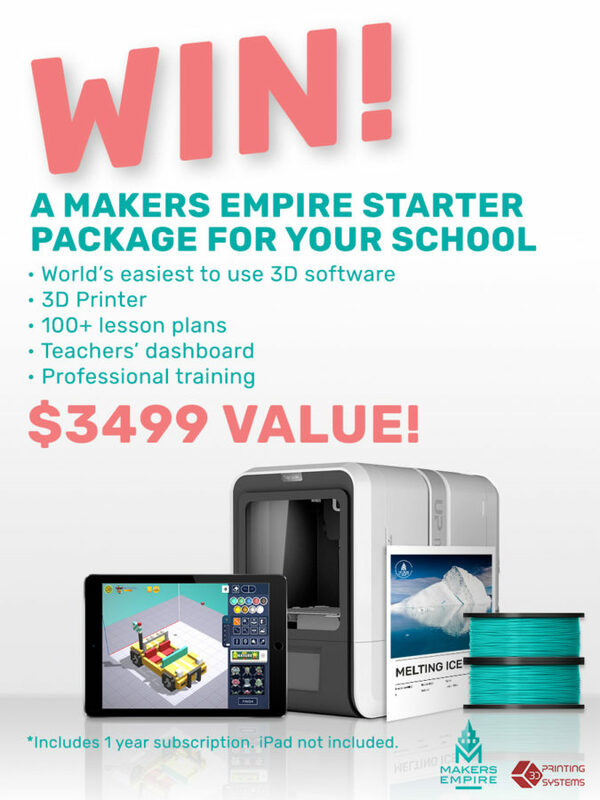 The winner will win Makers Empire 3D Starter Package (valued at $AUD3,499) for his or her nominated school. This competition is jointly sponsored by Makers Empire and 3D Printing Systems. Ideal for those looking at budget planning and implementation, those who want to learn if Makers Empire is a good fit and those who have lots of questions. 2. An entrant must be an individual Australian or New Zealand resident and not a company or organisation. Entrants under the age of 18 years must have the consent of their parent or guardian to enter. Employees of Makers Empire or their family members or anyone else connected in any way with the competition or helping to set up the competition shall not be permitted to enter the competition. 5. Opening date for entry will be 19th July 2017. Closing date for entry will be 29th Sep 2017. After this date no further entries to the competition will be permitted. 6. The prize consists of Makers Empire 3D Starter Package (valued at $AUD3,499) as detailed above. The prize does not include pictured Ipads, laptops or computers. 7. Entrants must nominate a school to receive the outlined prize. 12. The winner (and their nominated school) will be chosen by an adjudicator appointed by the Promoter. 13. The winner and winning school will be notified by email within 28 days of the closing date. If the winner cannot be contacted within 14 days of notification, we reserve the right to withdraw the prize from the winner and pick a replacement winner. 14. The promoter will post the prizes to the winning school. 19. You are providing your information to Makers Empire and not to any other party.